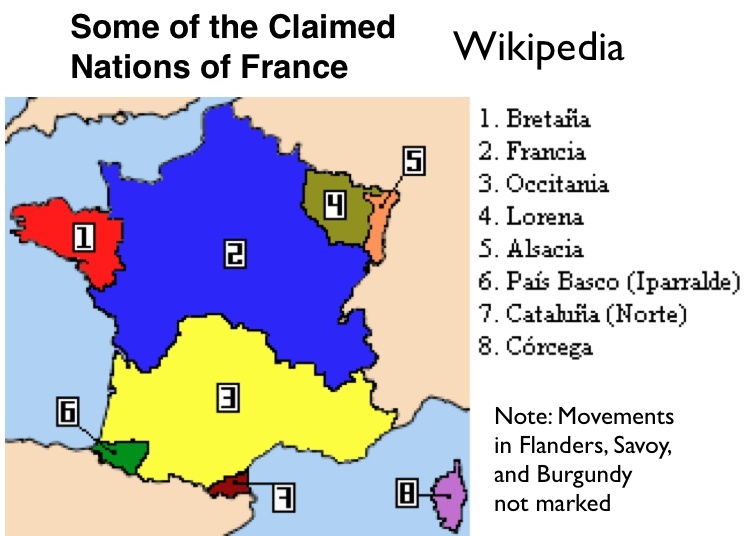 France is often regarded as a model nation-state. Its national identity is pronounced, its government has long claimed to represent the national will, and its state structures are strong and centralized. But even in France, the nation-state remains an incompletely realized ideal. France’s colonial holdings and overseas department most clearly challenge the identity of state and nation (see the previous posts on New Caledonia and French Polynesia). Yet even Metropolitan France ­– the republic’s European core – falls well short of forming a complete nation state. French nationalism emerged more slowly than is often realized, not reaching general consolidation until the late nineteenth century. 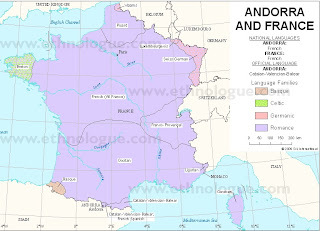 In the early 1800s, most citizens did not speak French, communicating instead in a variety of local dialects and other languages. As Eugen Weber argued in his influential 1976 book, Peasants into Frenchmen, the French government –and army – gradually melded the inhabitants of the country into a self-conscious nation. Although this process was successful overall, it never reached completion. Small but vocal minorities in outlying regions still reject French nationalism. Claiming that they form their own nations, some citizens demand autonomous areas if not outright states. 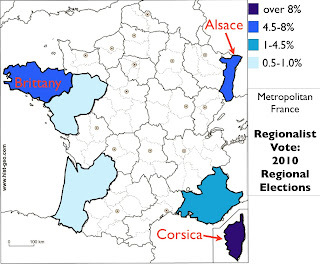 In Metropolitan France, anti-French sentiments are strongest in Brittany and Corsica, two areas noted for their distinctive cultural and linguistic traditions. Minor but occasionally violent secessionist movements persist in both areas. In the March 2010 French regional elections, the pro-independence party Corsica Libera won almost ten percent of the local vote, while the regionalist Party of the Corsican Nation received nearly twenty percent. Breton nationalist parties did not do as well, but the secessionist Breton Party took almost five percent of the vote, while Terres de Bretagne received another 2.4 percent. 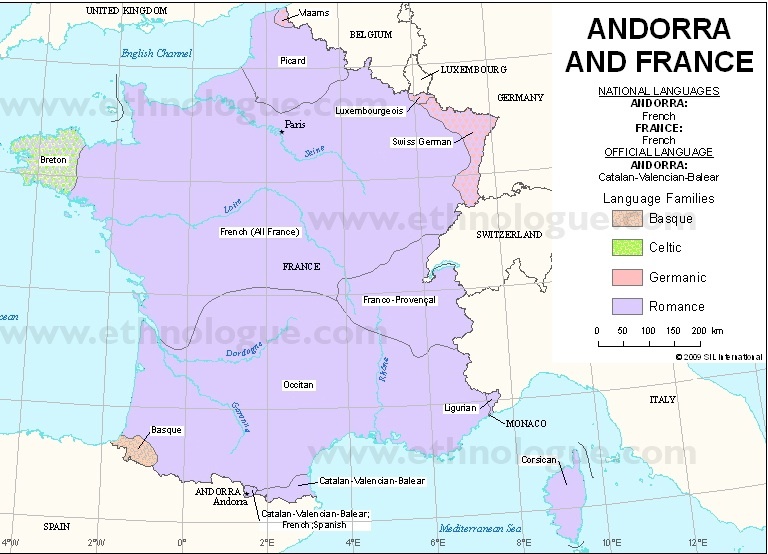 Regionalist political movements, some seeking independence, can be found wherever languages other than standard French persist. Groups and political parties seeking either autonomy or secession can be found in the Basque Country (Abertzaleen Batasuna [AB], Batasuna, Eusko Alkartasuna [EA], Parti Nationaliste Basque), Burgundy (Mouvement de libération de la Bourgogne), Alsace (Alsace d’Abord, Forum Nationaliste d’Alsace-Lorraine, Union du Peuple Alsacien), Normandy (Le Mouvement Normand), “Northern Catalonia” (Esquerra Republicana de Catalunya), Savoy (Savoy Region Movement, Savoyard League), Occitania (Partit de la Nacion Occitana, Partit Occitan, Iniciativa per Occitània, Anaram au Patac, Hartèra), and French Flanders (Le Bloc Représentatif du Nord-France et Flandres Frances). Although few of these groups enjoy widespread support, their very existence challenges French national unity. Secession movements in France are linked to a variety of political positions. Older secessionist movements are often leftist, whereas newer groups tend to the right. Some are, or at least claim to be, more ideologically ambiguous. A case in point is Alsace d’Abord (Alsace First), a new party that seeks regional governance as well as local bilingualism in French and Alsatian (a Germanic dialect). Alsace d’Abord, which contests immigration and opposes Turkey’s membership in the European Union, is generally regarded as hard right. The organization, however, disputes this classification. In fact, it has called for the annulment of the recent election in Alsace, alleging that it was given the incorrect official designation of “extreme right” instead of its preferred self-designation, “regionalist.” On issues of national identity and regional autonomy, the left-right divide evidently obscures as much as it reveals.